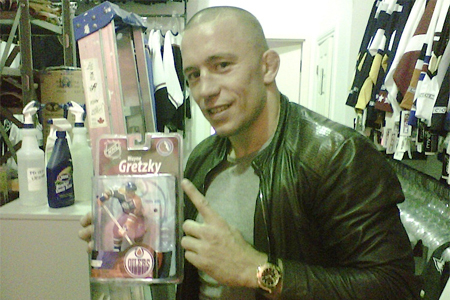 The biggest welterweight showdown in mixed martial arts history is set for Super Bowl weekend when Georges St-Pierre (Pictured) defends his crown against Nick Diaz at UFC 143. Fans haven’t seen St-Pierre since he took home a unanimous decision win over Jake Shields at UFC 129 in April, but don’t expect for the nine-month layoff to affect him come February 4th. St-Pierre was originally scheduled to face Diaz in October, but after Diaz failed to show up for promotional events he unforgettably dubbed as “beauty pageants,” the UFC opted to replace him with Carlos Condit. The former Strikeforce champ proceeded to beat up BJ Penn like nobody had done before, while St-Pierre was forced out of his scrap with Condit after suffering injuries to his knee and hamstring. Diaz’s lopsided victory allowed him to leapfrog Condit on the 170-pound ladder and secure another shot at the throne. The French-Canadian is well aware of the dangers that the biggest threat to his title run poses, but he doesn’t believe Diaz’s prowess will be enough to supplant him. “He’s a very good boxer, probably one of the best in mixed martial arts,” St-Pierre said. “Also very good jiu-jitsu, but I believe I’m better than him everywhere. That’s great, Georges. Just remember that in America you have to press ‘1’ before dialing Stockton’s ‘209’ area code.